Yesterday was the first day of school at our house. A tradition at our house is to celebrate that day with “First day of school ice cream.” We try very hard around here to celebrate whenever we can with homemade ice cream! Doesn’t everybody? Since the Colorado peaches are in at Smith’s Market and I had made a peach pie for a friend last week, I thought why not a peach crisp for the family along with peach ice cream? 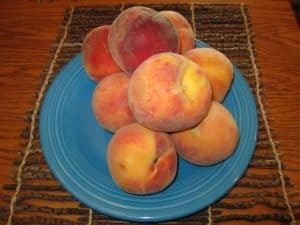 Then my mind wandered to other uses of peaches, and I thought I would share them with you. I use basically the same filling for several recipes, that is my idea of a good recipe…many different uses. Follow the recipe below and with a little variation, you can use it several ways – pie filling, crisp, cobbler, or a topping for ice cream or yogurt. Peel and cut peaches and place in bowl. Mix the next 5 ingredients and then add the flour. Pour the dry ingredients over the peaches and lightly mix together. Preheat oven to 425. Make your choice of crust (or buy one, I won’t tell). Line bottom of pan with crust. Put in fridge, along with top crust so it doesn’t get warm. Fix the filling recipe above. DO NOT fix the filling recipe before you have the crust ready. It will accumulate too much liquid. Place filling in bottom pie crust and then add top pie crust. Seal top to bottom as you usually would. Make a few slits in top of pie. Brush with egg wash and put in freezer for 15 minutes (trust me on this). he time in the freezer tends to help make it flakier. Make your streusel for your crisp or your pie crust and put into fridge. Then make the filling above and place in 8 X 8 greased pan. Sprinkle streusel over top and bake at 350 for 20 – 30 minutes. For a cobbler, put filling in an 8 X 8 pan and cover with crust. Brush with egg wash and bake for 30 – 40 minutes. An easy streusel topping can be made with 1 cup oatmeal , ½ cup brown sugar, 2 tblsp. flour and 2 tblsp. softened butter. Place peeled and cut peaches in saucepan. Stir remaining ingredients together and then add to peaches and stir. Heat on stove top on medium low until begins to lightly boil. Stir the peaches occasionally so they do not scorch. Once they lightly boil, turn to low and continue to cook for 10 – 15 minutes to allow the syrup to thicken. Take off heat and mash with a potato masher or fork (whatever you have). Let this cool and there you go . . . wonderful topping for whatever you want . . ice cream, yogurt, pancakes, waffles even a cream cheese block for an appetizer with crackers. If there are no children in the house, add a little amaretto or peach brandy when it is done cooking! Aren’t peaches wonderful? Enjoy them while they are in season.